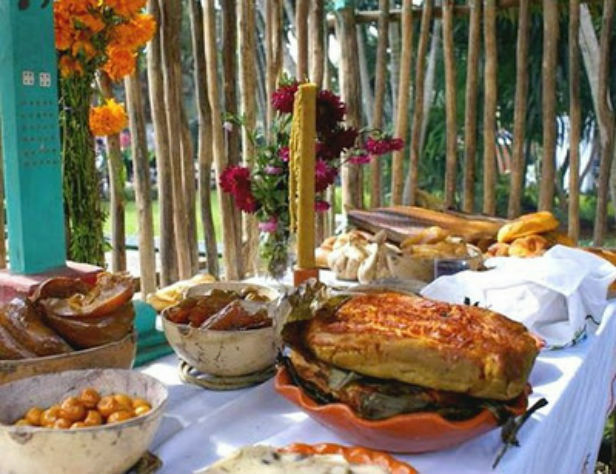 Hanal Pixan is the celebration of the Day of the Dead that originated from Mayan culture. The Mayans believed that death was simply another form of life. Hanal Pixan means “food of the souls” and is celebrated to remember friends and relatives that have passed onto to the afterlife. From October 31 to November 2 is when the deceased are permitted to visit their loved ones. 1. Your house must be clean. In addition to making special holiday tablecloths and favorite food dishes made from the heart, it is customary to wash all the laundry and tidy the house. This is a sign that deceased loved ones are expected to visit soon. 2. Protect the children and tie up the dogs. In some families it is customary to have the children wear a red or black ribbon tied around the right wrist to prevent the spirits from taking them. Tying up the dogs helps allow the spirits to freely pass through the house undisturbed. 3. An altar for the deceased. 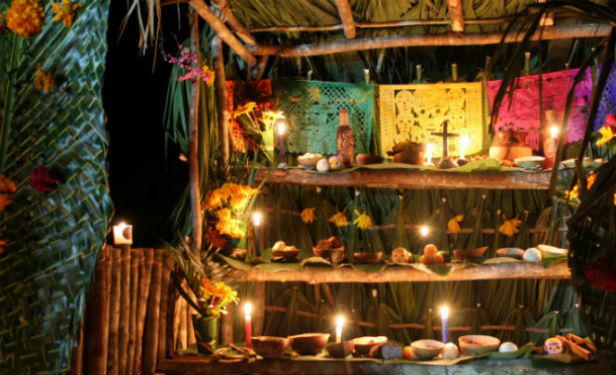 The altar is placed on a table in the house or sometimes at the grave of the deceased. 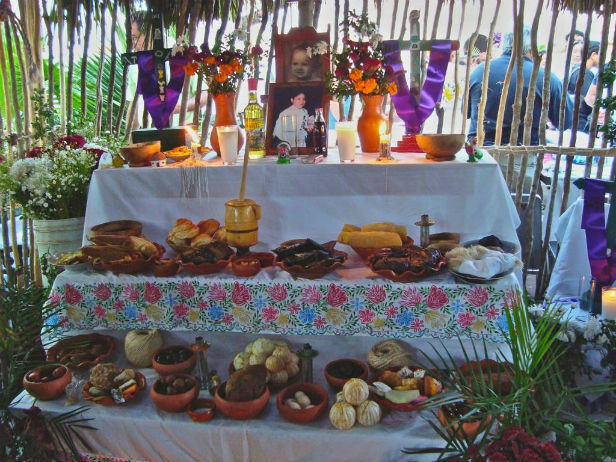 In most of the country they place pictures of the deceased, flowers, and candles at the altar, however in the southeast of Mexico, the tradition is to add Mayan food like atole nuevo (a hot corn-based beverage), pibes or muchipollos (similar to a tamale), xec (a mix of orange, mandarin, jicama, and other fruits with chili powder), tamales de x'pelón, vaporcitos, balché (an alcoholic drink made from the bark of a tree), pastries, and gourds with the flavor of tan-chucuá (a form of atole which is made with corn, cacao, pepper and anise). It's a large tamale made with corn and lard dough stuffed with chicken and pork meat, tomato, and peppers. Mucbipollos are wrapped in banana leaves and prepared according to the original tradition: in the yard of the house there is a hole in the ground where they put firewood and stones and cook underground. 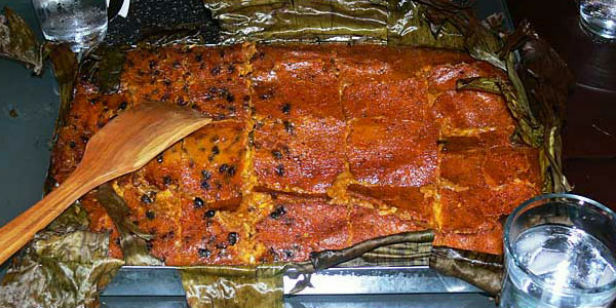 This is the same way in which they cook other dishes such as tortas pibil-x'pelón. 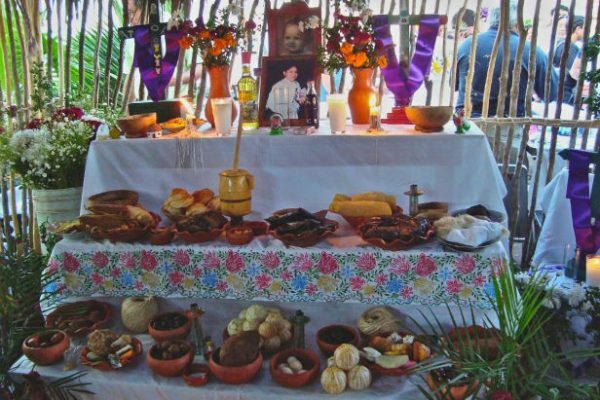 If you feel generous, at the altar you can place an extra plate of food, water, tortillas, and a candle for the deceased souls that maybe no one remembers. This way, the family invites the souls of their loved ones and any extra souls who may need somewhere to dine.